(Solon, Iowa) – A chain link fence sits just beyond second base. There was a time years ago when that barrier was a temporary snow fence, erected in the fall to keep football fans from entering the stadium anywhere other than the main gate. Just beyond that fence is a set of bleachers for the visiting team’s fans, most eventually witnessing defeat as the home team has won three consecutive state football championships. This is the view I see from the catcher’s perch, looking out on the old baseball field. A forgotten stepchild of a facility, this field was nothing but a seasonal accommodation for a sport that was sparsely attended in the summertime, when school was out and the lake waters were warm and inviting. The infield was exclusive to baseball, but once you ran beyond the dirt you were on the football field, a shared patch of grass that gave the baseball field odd dimensions, yet still lit up the June and July nights with the sound of optimistic cheers and batted balls. I don’t write this to complain. The new baseball field is an unbelievable facility for a small Iowa high school, with plush grass and a nice warning track around the entire playing surface. On the old field there was no warning track; only a slight down slope before running into the fence on the outer boundary of the football field, which also served the baseball team as center and right field. In left field, the road leading to a parking lot and passing by the tennis courts acted as a warning track. I remember, in fact, several games during my high school career that were temporarily halted so the umpires could instruct a passing car to turn around and exit what was actually fair territory. A ball over the road and off the high fence of the tennis courts was in play. Although I never saw it happen, a ball over the high fence and into the courts would presumably be a home run. If you were playing left field, your relay toward home plate on a well hit ball would need to avoid the goalpost that was also in fair territory. 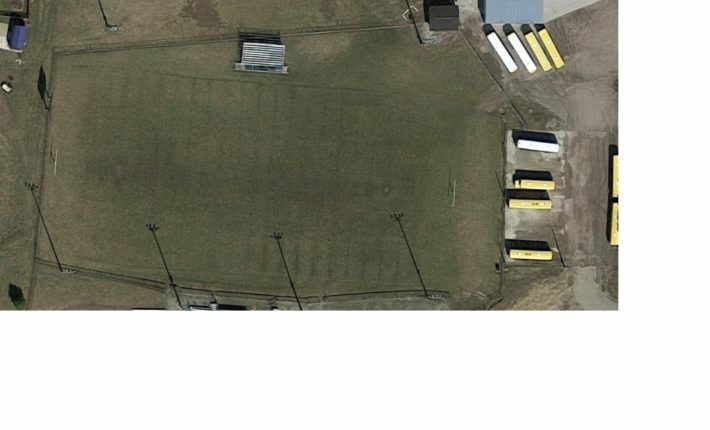 This was our home field, and at the time, it just wasn’t something we gave much thought to. I recently went back to Solon to watch a soccer game, a sport that didn’t exist when I was a Spartan. The kids were talented, and although they lost a heartbreaking game that would have given them their first state tournament berth in this sport, it was redeeming to see the local fan support, even in a loss. It was the first athletic contest I’d seen in Solon since leaving that old baseball field in tears 30 years before, crying not because of the outcome (our 1-0 victory kept a conference rival from winning the title outright while we finished third), but rather because of the realization that it would be the last game I would play on what was, to me, hallowed ground. Ironically, I still have a ball from that final game, something I sprinted from my catcher’s spot to retrieve from our freshman second baseman after he corralled a pop fly for the final out. Somehow I knew then how much that ball would mean to me now. Before reaching high school, we played Babe Ruth baseball on that field. For some as fortunate as me, we played five years of varsity baseball on that field. It was a place we learned about life, about winning, about losing. A place where we all came together as one. Enjoying moderate success as a player, I walked off that field for the last time, drove out of town, and didn’t return for the next 15 years, losing track of teammates, classmates, and memories. To some, there’s something exhilarating about breaking free. At the time, I’m reasonably sure that’s what I considered it. Unfortunately, it wasn’t until my twenty year class reunion that I realized just how much I’d left behind. Since that time I’ve reconnected with many of my old classmates, and some I talk to on a frequent basis. No longer a resident of Solon, I didn’t witness the building of the new baseball facility, or the demise of the old one. A week ago, something lured me back to that place, now a forgotten patch of land behind my old high school, a building that now serves as the middle school in this growing and prosperous town. The view from behind the plate hasn’t changed, other than the chain link fence and bleachers that adorn the visitor’s sideline of the football field. Anything related to the football structure remains. That isn’t the case with the “baseball” portion of the facility. The benches and side fencing is no longer there; the mound is flattened, and the home plate area is a weed patch. I didn’t actually search for home plate to see if it was still there, but it wasn’t obviously present if it was. No small set of bleachers sits directly behind the backstop, one that shared fans from both teams in the past. But the backstop, the reminder of days gone by, still sits in its original spot, likely forgotten, but stubbornly anchored against a final onslaught of progress. A little thought and the symbolism here is evident – a new baseball field built by what friends describe today as citizens of a more progressive community, with a shiny fence to accentuate new and shiny ideals. The old backstop, like rusting implements, signifies the citizens and mindset of the once predominant farming community, standing lonely but proud, a relic of Solon’s demographic past. Rather than looking forward, however, my visit this day is about the memories. It’s not just about the games of past, some that I can remember, many more I’ve forgotten. The backstop was a social landmark, a place where you could sit in that small set of bleachers on a clear summer evening and talk about the future with friends, guaranteed privacy from street lights and meddling neighbors. It was a place you could offer up your best pitch the summer after your sophomore year, and still strike out with the freshman girl you found yourself professing your eternal love to. Quite simply, it was a central point of my being those many years before. Now it sits alone, still able to perform as it always did, likely surviving because the cost of removal exceeds the cost of isolation. The reality is, every landmark means something to someone, regardless of how insignificant it has become to others. The backstop remains an enduring reminder of an earlier time, even though many of the priceless moments in its presence are forgotten. What amazing writing! You do a wonderful job! As I read it, more and more memories came to mind. Oh the fun times! I’m so glad that we have reconnected. Keep up the great writing!